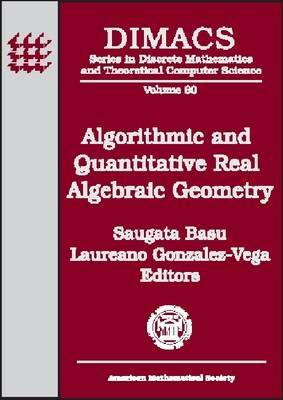 Algorithmic and quantitative aspects in real algebraic geometry are becoming increasingly important areas of research because of their roles in other areas of mathematics and computer science. The papers in this volume collectively span several different areas of current research. The articles are based on talks given at the DIMACS Workshop on 'Algorithmic and Quantitative Aspects of Real Algebraic Geometry'. Topics include deciding basic algebraic properties of real semi-algebraic sets, application of quantitative results in real algebraic geometry towards investigating the computational complexity of various problems, algorithmic and quantitative questions in real enumerative geometry, new approaches towards solving decision problems in semi-algebraic geometry, as well as computing algebraic certificates, and applications of real algebraic geometry to concrete problems arising in robotics and computer graphics.This book is intended for researchers interested in computational methods in algebra.